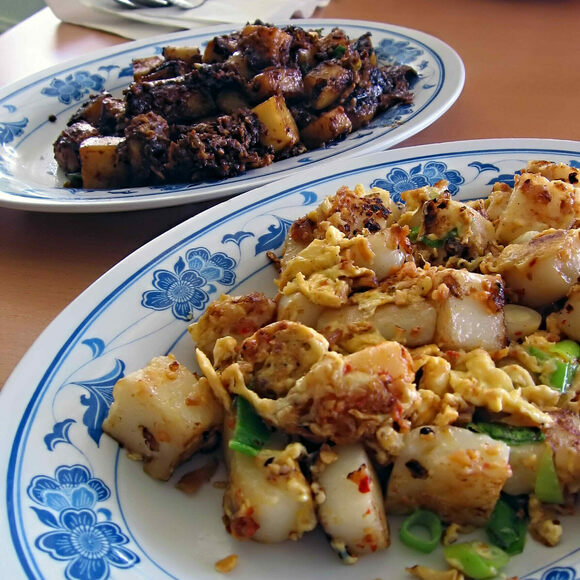 When you order chai tow kway, or “carrot cake,” in Singapore, what you get could be more accurately described as a radish omelet: A daikon steamed with rice flour, then chopped and fried with garlic, preserved turnips, and eggs. So, what’s with this misleading name, and how did the dish wind up in Singapore? The answer is simple: In China’s Hokkien dialect, chai tow means “radish” or “carrot,” while kway means “pastry” or “rice cake.” The dish likely originated in Southern China and was brought to Singapore by Teochew immigrants in the late 19th century. The original version consisted of cubes of rice cakes fried with dark soy sauce. After that, its exact development descends into hearsay. Ng Soik Theng, a Teochew hawker in a Singapore market, claims to have been the first to add white radish in the 1960s, and to call it chai tow kway. Another hawker, Lau Goh, removed the dark sauce, replacing it with a sprinkle of the light variety. Cooks now sometimes replace the light soy with fish sauce. Both options are still available, known as “black” or “white.” Either way, it’s delicious—a sizzling, fragrant pile of salty, fatty starch. Just don’t hold your breath for cinnamon or cream cheese. Singapore is peppered with indoor hawker centers that serve chai tow kway. If the big sign saying "Fried Carrot Cake" isn't a dead giveaway, the long line of people should be. The black variant is said to be especially good here.